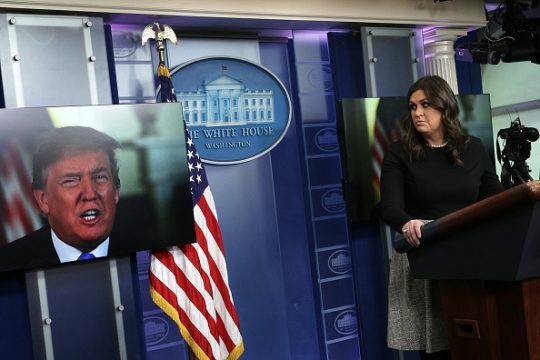 While White House press briefings were a near-daily occurrence on weekdays during Obama administration, they have become increasingly rare under Trump and his chief spokeswoman, Sarah Sanders. Sanders last conducted a briefing on Dec. 18, 2018, and she has only held five since the beginning of September, according to an archive of White House briefing transcripts. "The reason Sarah Sanders does not go to the "podium" much anymore is that the press covers her so rudely & inaccurately, in particular certain members of the press. I told her not to bother, the word gets out anyway! Most will never cover us fairly & hence, the term, Fake News!" he wrote. White House spokesman Hogan Gidley told Fox News on Tuesday that Sanders would head back to the podium "when she finds a reason to do that." He criticized what he portrayed as a double standard by the media, saying press members complained that Trump didn't speak to them enough. Trump frequently addresses the media in impromptu press conferences outside the White House before traveling places. He took the media to task over its coverage of a viral confrontation between teenage supporters of his and a Native American man at the Lincoln Memorial last week. Initial reports misleadingly portrayed the teens as chief antagonists in the situation, claiming they taunted and surrounded the man, when additional video and eyewitness accounts told a far more complex story. This entry was posted in Politics and tagged Donald Trump, Media, Sarah Sanders, White House. Bookmark the permalink.